Background: Berberis aristata DC (Berberidaceae) commonly known in Hindi as "Dāruhaldi" and "Citra," is an important medicinal herb native to Northern Himalaya region. The plant is used traditionally in Indian system of medicine as an antibacterial, antiperiodic, antidiarrheal and anticancer and it is also used in the treatment of ophthalmic infections. Its root, stem and leaves also find their use in treatment of various ailments and hence is used extensively in Ayurveda. Materials and Methods: Samples of the whole plants of B. aristata were collected and identified. Hand and microtome sections were taken, stained and mounted and the cell content and cell wall structure were studied according to the method described by Kay and Johansen. Representative sketches were made with the help of camera Lucida. Methods for determining the quantitative values were the same as described elsewhere. For fluorescence analysis, the powder of the root, stem and leaf were examined under ultraviolet light. Total ash, acid insoluble ash and water-soluble ash values and water- and alcohol-soluble extractives were determined. 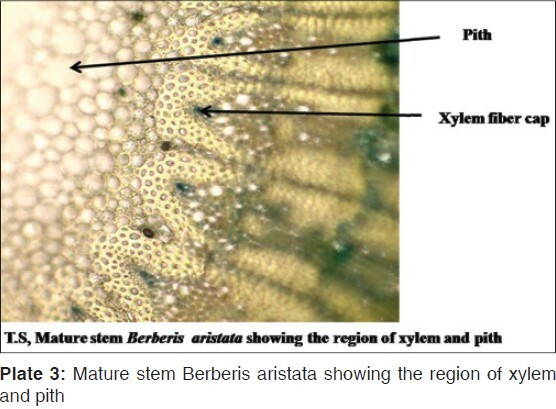 Results: The detailed investigations carried on the pharmacognosy of the root; stem and leaf of B. aristata have brought out some salient diagnostic features, which allow one to differentiate it from other substitutes and or adulterants. The determination of quantitative values, fluorescence analysis and the use of lycopodium spore analysis has specifically contributed to this differentiation. Conclusion: From the foregoing observation on the pharmacognosy of root, stem and leaf of B. aristata DC, the salient diagnostic characters of three parts have been presented, which can allow one to differentiate it from other substitutes and or adulterants. Berberis aristata (Berberidaceae), commonly known in Hindi as "Dβruhaldhi" and "Citra" is spinous herb native to mountainous parts of Northern India and Nepal. These shrubs are distributed throughout the Himalayas, it is also found in Southern India in Nilgiri hills and also in Sri Lanka. It is extensively used in Ayurvedic system of medicine from times immemorial. Its properties are said to be analogous to those of turmeric. Indian barberry and its extract "rasot" are regarded as alterative and deobstruent and are used in the treatment of skin diseases, menorrhagia, diarrhea, jaundice and also in various affections of the eyes. A decoction of the root-bark is used as a wash for ulcers and is said to improve their appearance and promote cicatrization. The plant extract forms one of the constituents of a herbal cream, Dermocept used against sarcoptic mange lesions, exhibiting inhibitory effect against Salmonella typhi in-vitro and also exhibited antiamoebic activity against Entamoebic histolytica. B. aristata also possesses stomachic, astringent, antiperiodic, antipyretic, antidiabetic and diaphoretic properties. The leaves are reported to be used in hepato-bililary disorders. The berries along with other plant-based ingredients have shown hypocholesterolemic effects in rabbits . The plant contains isoquinoline alkaloids  out of which berberine is a major bioactive constituent. Samples of the whole plants of B. aristata and Berberis asiatica were obtained from Bhimtal (Uttarakhand) and identified by Dr. Tirathkumar, Asst. Professor, Department of Pharmaceutical Science, Kumaon University, Bhimtal (Uttarakhand). Hand and microtome sections were taken, Stained and mounted as usual and the cell content and cell wall structure were studied according to the method described by Kay and Johansen. , Representative Sketches were made with the help of camera Lucida. Methods for determining the quantitative values were the same as described elsewhere . For fluorescence analysis, the powder of the root, stem and leaf were examined under ultraviolet light . Total ash, acid insoluble ash and water-soluble ash values and water-and alcohol-soluble extractives were determined . 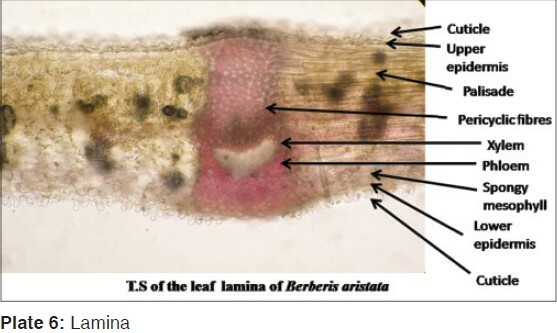 The macro-morphological and organoleptic characters of root, stem and leaf were studied by observing the different plant parts as such and also with the help of a dissecting microscope. For showing the arrangement of tissues and cells, the sections of these parts were taken, cleaned with chloral hydrate and stained with phloroglucinol/hydrochloric acid. The details of the microscopic observations were drawn with the help of Camera Lucida. For a detailed analysis of xylem, phloem fibers and stone cells, relevant portions of the tissues were macerated with Shultz's Fluid, observed and their representative sketches were drawn with the help of Camera Lucida. Photograph of the sections were also taken with the help of Canon ixus 130 camera. 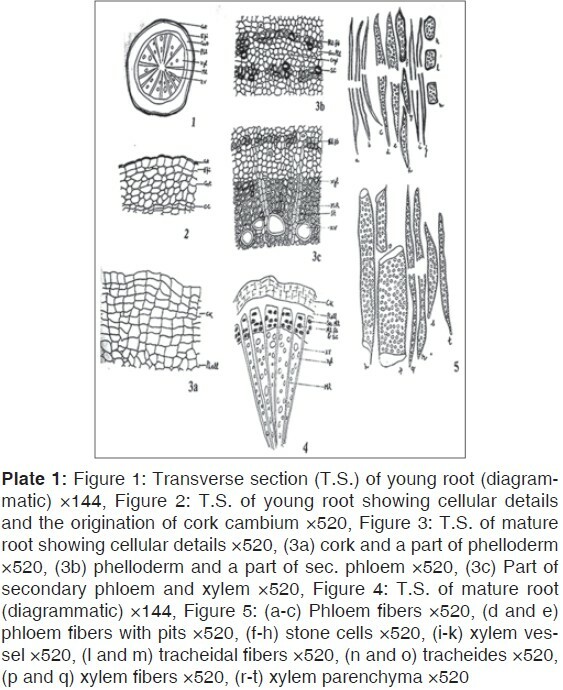 The young root [Plate 1 [Additional file 1], Figure 1] shows a single layered epidermis comprising of larger mostly radially elongated cells covered over by a cuticle. This is followed by cortex, 5-7 layers of cells wide, comprising of circular, isodiametric, polyhedral and tangentially elongated cells enclosing within it a polyarc stele. Cork cambium arises in the 5 th -6 th layer of cortex. 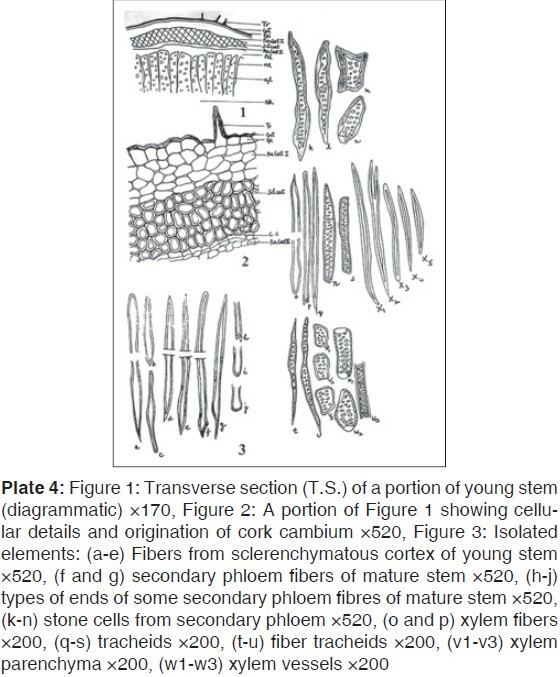 [Plate 1, Figure 2] As the secondary growth proceeds, cork cambium produces cork on the outer side and phelloderm on the inner side. Thus in the mature root [Plate 1, Figure 3]a-c, the cork is 9-10 layers of the cells wide whose cells are tangentially elongated and thin walled. This is followed by a narrow zone of phelloderm 3-5 layers wide with thick walled ellipsoidal cells having very few intercellular spaces. Following this, is a wide zone of secondary phloem composed mostly of phloem parenchyma with intact sieve tubes and sieve plates, which are more on inner side of the phloem. Some of the parenchymatous cells of the phloem are converted into fibers as well as stone cells. The fibers are much more in number than stone cells. The stone cells are in ones or twos embedded within the groups of fibers, which are present in 2-3 discontinuous circular rings surrounding the xylem [Plate 1, Figure 3]b and c. The fibers are strongly lignified and are of two types. The first ones are relatively thinner, pointed at their respective ends, without pits with a few of them having outgrowth toward their ends [Plate 1, Figure 4a-c]. The other ones are relatively larger in diameter, but smaller in length than their first counterparts with profuse thickening and bordered pits on their walls [Plate 1, Figure 4]d and e. The number of fibers with pits are much less in number than the fibers without pits. Stone cells are also strongly lignified, much shorter in dimensions, with highly thickened walls and having vertical pits on their walls [Plate 1, Figure 4f-h]. The medullary rays become wider and funnel shaped as they traverse the region of the secondary phloem. The wood is diffused, porous and consists of trachea, tracheids, fibers, fiber tracheids and xylem parenchyma traversed by 2-3 celled wide medullary rays [Plate 1, Figure 3c]. All the elements of xylem except medullary rays are strongly lignified. The xylem vessels are drum shaped and have mostly bordered pits on their walls with distinct perforation rims and some possess pointed tail like ends [Plate 1, Figure 4n-p]. The tracheids have blunt to pointed ends and possess bordered pits on their walls [Plate 1, Figure 4s and t]. Xylem fibers are long, thickened with perceptible lumen and pointed ends. Seldom one finds fibers with outgrowth on their walls near its ends [Plate 1, Figure 4i and j]. The fiber tracheids are long with bordered pits on its walls and are thicker when compared to xylem fibers [Plate 1, Figure 4q and r]. Xylem parenchyma is rectangular or polygonal in shape and contains simple pits on their walls [Plate 1, Figure 4k-m] [Table 1]. Starch grain mostly simple, are found distributed in the cell constituting the medullary rays. Prismatic crystals of calcium oxalate are sparsely distributed in the region secondary phloem. 0.2-1.0 cm in diameter is nearly cylindrical having longitudinal fine wrinkles running parallel to each other on the external surface; scars of the lateral branching and a few lenticels seen on the external surface; a transversely cut and smoothened surface shows a yellowish bark about half of the size of the radius of the stem and a yellow wood with a distinct central pith; Fracture short and slightly fibrous and taste bitter. 3.8-10 by 1.5-3.3 cm, obovate or elliptic, entire or spinous-toothed, base gradually narrowed, with prominent reticulate nerves, glossy dark green above, glossy pale green but not glaucous beneath, brittle, odor indistinct; bitter taste. The midrib [Plate 5 [Additional file 5] and Plate 7, Figure 1] has concavo-convex outline with more dorsal convexity than the ventral concavity. It shows a single layer of epidermis, the cells of which are of cubicle to tangentially elongated type. The cells of the upper epidermis are larger than the cells of the lower epidermis. The epidermis is covered externally by a thick cuticle, which appeared to be deeply ridged/furrowed on both sides. The cuticular furrows in the upper side are larger than those of the lower side. Below the epidermis is a wide cortex comprised of 3-5 layers of thick walled parenchyma on the ventral side and 5-8 layers of thick walled parenchyma on the dorsal side. The Parenchyma is polyhedral and isodiametric to circular in shape with very little intercellular spaces in between them. Surrounding the vascular tissue all around is a discontinuous strand of 4-6 layers of pericyclic fibers with thick lignified walls having a small lumen in between them. The fibers are long somewhat pointed, blunt or truncated ends [Plate 7, Figure 5a] 1 and a 2 . The vascular structure shows a discontinuous ectophloicsiphonostele enclosing in the center central small pith, which consist of thin walled polyhedral to isodiametric parenchymatous cells. The medullary rays, 1-2 cells wide traverse through the xylem and phloem regions. The phloem consists of sieve tubes, sieve plates and parenchyma. Phloem fibers are absent. The xylem consists of trachae, tracheids, tracheidal fibers, xylem fibers and xylem parenchyma. All these elements are lignified. The trachea is elongated with spiral, annular, scalariform and bordered pits. The later have distinct perforation rims (Plate 7, Figure 5d] 1 -d 4 ). The tracheids are of two types. The long ones have smooth margin and with thickening which is either of scalariform or with bordered pits. The short ones have an irregular margin and scalariform type of thickening. Fiber tracheids are abundant in number, along with pointed or blunt ends and with thickening which is either of scalariform type or of bordered pitted type [Plate 7, Figure 5c] 1 and c 2 . 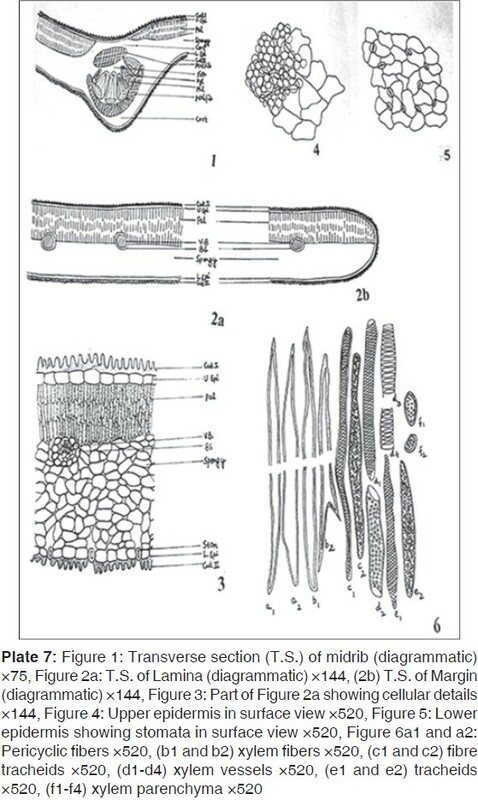 The xylem fibers are very long highly thickened with narrow central lumen and mostly tapering pointed ends or at places with truncated ends [Plate 7, Figure 5b] 1 and b 2 . Xylem parenchyma is also thickened with simple pits on their walls [Plate-7, Figure 5f] 1 and f 2 . Lamina [Plate 6 [Additional file 6], Plate 7 [Additional file 7], Figure 2a and b, and Figure 3] shows a dorsi-ventral arrangement of the mesophyll. 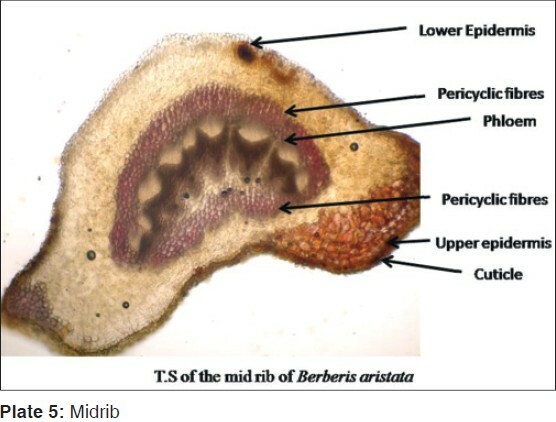 The upper epidermis is composed of mostly tangential elongated cells covered over by a tick cuticle which, like that of the midrib, is deeply ridged/furrowed. 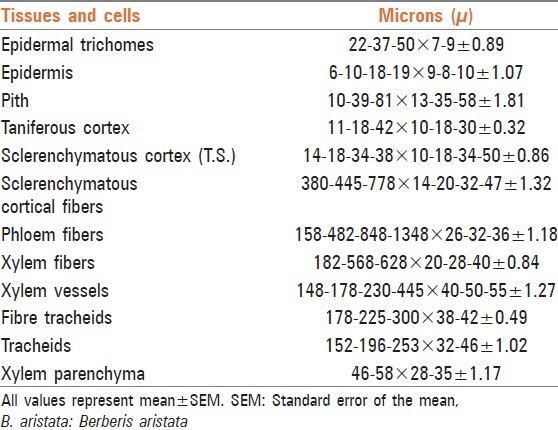 The cells of the lower epidermis resemble those of the upper epidermal cells, but are comparatively smaller in size. Both of these cells, in surface view show sinuous anticlinal walls. However the cuticular furrows are larger on the ventral side than those observed for the dorsal side. 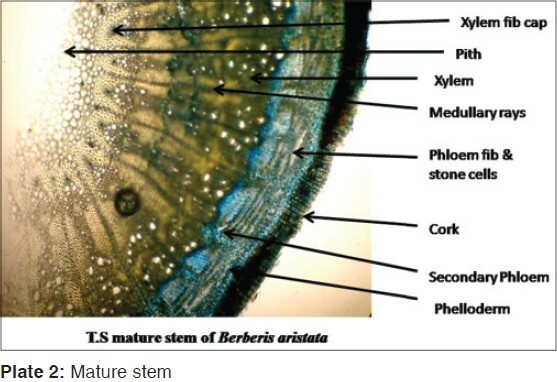 The stomata occur on the lower surface only. They are of anomocytic type [Plate 7, Figure 4] being surrounded by 4-5 subsidiary cells which do not differ much from each other. Below the epidermis, is found a three layered palisade tissue, the cells of which have straight walls. They are compactly arranged and having a larger number of chloroplast [Plate 7, Figure 3]. The palisade tissue [Plate 7s, Figure 6] extends right up to the margin of the leaf. Below the palisade tissue is the spongy tissue, which consists of 6-8 layers of irregularly and loosely arranged parenchymatous cells through which veins transverse in various directions. The vascular bundles are surrounded by bundle sheath consists of 9-11 cells, which are of slightly circular type than the surrounding spongy mesophyll parenchyma [Table 3]. The root powder appears to be yellowish, fibrous with bitter taste. The fibers and stone cells are seen to be present almost everywhere. The fibers are strongly lignified. Some containing bordered pits where as some are of plain type. The stone cells are strongly lignified much shorter, more thickened with vertical pits on their walls. Besides simple starch grains and prismatic crystals of calcium oxalate are seen sparsely distributed. The stem powder is yellowish in color, fibrous in composition and bitter in taste. It shows the presence of fibers and stone cells. The fibers are long, lignified with small lumen and at time with forked ends. The stone cells are lignified mostly rectangular to squarish in shape with pits on their walls. Vessels with bordered pits and spiral type of thickening are also seen prominently. Powder of the leaf is greenish yellow in color with bitter taste. Fragments of upper and lower epidermis in surface view, both with sinuous walls, the epidermal cells of the lower surface being smaller in size and with anomocytic type of stomata are seen. Fragments of leaves with compactly arranged palisade in three layers are also seen. Total ash, acid-insoluble ash and water-soluble ash of root are 2.19, 0.05 and 0.025% (W/W) respectively. Alcohol and water soluble extractive values are 8.45 and 12.0% (W/W) respectively. Total ash, acid-insoluble ash and water-soluble ash of stem are 2.65, 0.266 and 1.97 (W/W) respectively. Alcohol and water soluble extractive values are 15.55 and 11.820% (W/W) respectively. Total ash, acid-insoluble ash and water-soluble ash of leaf are 12.32, 4.62 and 2.57% (W/W) respectively. Alcohol and water soluble extractive values are 10.50 and 8.5% (W/W) respectively. 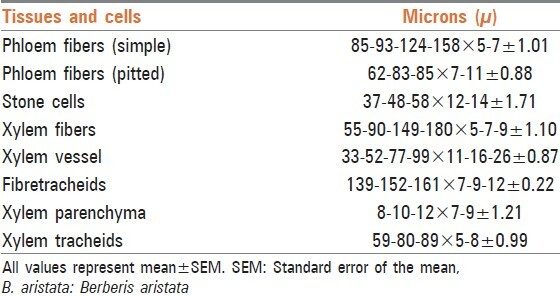 Fluorescence characteristics of B. aristata plant (root, stem and leaf) under ultraviolet light are recorded in [Table 4]. B. aristata (Dāruharidrā) is an important Ayurvedic medicinal plant known for curing certain ailments. Its root, stem and leaves are extensively used in the Indian system of medicine; the latter two also find their use as crude drugs. Some work on the pharmacognosy of its root is on record,  but the reported findings on the root appear to be erroneous. The groups of fibers have been shown as pericyclic fibers and stone cells have been reported to be present as separate groups in the region of fibers. In fact, the fibers present are phloem fibers and stone cells are merged along with the groups of fibers and both of them occur in concentric rings in the external part of the secondary phloem. The phloem fibers have been reported to be of plain type only but our findings have shown that there are two types of fibers viz. plain type and those with bordered type of thickening. Hence from the present investigation, an attempt has been made to bring out detailed pharmacognostical study, which could distinguish this plant from other species, allied drugs or substitutes. From the foregoing observation on the pharmacognosy of root, stem and leaf of B. aristata DC, the salient diagnostic characters of three parts have been presented, which can allow one to differentiate it from other substitutes and or adulterants. The authors are very thankful to the Director of School of Pharmacy, Bharat Institute of Technology, Meerut, U.P. for providing necessary support for research program. We express our thanks to Dr. Tirath Kumar, Asst. Professor, Department of Pharmaceutical science, Kumaon University, Bhimtal (Uttranchal) who helped us during drug collection and authentication. 1. Sharma K, Bairwa R, Chauhan N, Shrivastava B, Saini NK. Berberis aristata: A review. Int J Res Ayurveda Pharm 2011;2:383-8. 2. Kirthikar KR, Basu BD. Indian Medicinal Plants. Vol. I. Dehradun: International Book Distributors; 2005. p. 1064. 3. CSIR. The Wealth of India: A dictionary Indian Raw Materials and Industrial Products, Raw Materials. Vol. I. A-I. New Delhi: Council of Scientific and Industrial Research; 2007. p. 135. 4. Kay LA. The microscopical studies of drugs. 1 st ed. London: Bailliere, Tindal and Cox; 1938. p. 18-21. 5. Johansen DA. Plant Microtechnique. 1 st ed. New York, London: McGraw Hill Book Co., Inc.; 1940. p. 182-203 . 6. Wallis TE. Practical Pharmacognosy. London: J and A Churchill Ltd.; 1946. p. 185-6. 7. Chase CR Jr, Pratt R. Fluorescence of powdered vegetable drugs with particular reference to development of a system of identification. J Am Pharm Assoc Am Pharm Assoc 1949;38:324-31. 8. Khandelwal KR. Practical Pharmacognosy, Techniques and Experiments. 19 th ed. Pune: Nirali Prakashan; 2008. p. 149-56. 9. Anonymous. The Ayurvedic Pharmacopoeia of India. Part I. 1 st ed., Vol. I. New Delhi, Ministry of Health and Family Welfare, Government of India, Department of Indian System of Medicine and Homoepathy; 2001. p. 139. 10. Srivastava SK, Khatoon S, Rawat AK, Mahrotra S, Pushpangandan P. Pharmacognostical evaluation of the root of Berberis aristata DC. Nat Prod Sci 2001;7:102-6.